Tigger was saved from one of the shelters we work with in Texas. She is spayed, rabies, core vaccines, de-wormed, heart-worm and tick-disease tested; Negative and micro-chipped. She has an estimated date of birth of 24 July 2016 and she weighs around 30 pounds. 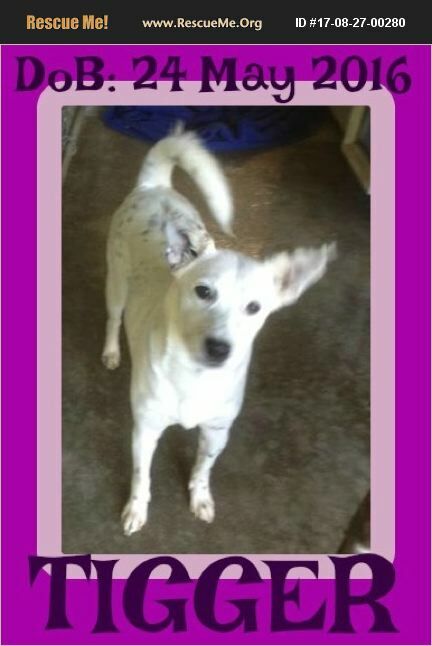 Tigger is listed has been listed as a Labrador / Dalmation mix. We have no way of knowing the true breed, it is up to you to decide what you think his breed/s is. Tigger is a happy go lucky girl, her tail is always wagging and she always has that contagious smile on her face, so happy to see anyone and share the love and affection. She loves to get her ears scratched and belly rubbed. She enjoys playing with toys and chewing on cow hooves. She is located in the kennels building and uses the dog door in her kennel to get out to the run to do her business. She has not had any accidents or been destructive whist in the kennel. She shares a kennel with Oreo and they are always playing and wrestling and having fun. She is great with all dogs of all sizes at playtime and loves to run around and chase and be chased. We do NOT have cats at the rescue so cannot comment on how she would be around, or near them. Tigger is a young girl with a lot of energy, we do not have time to work on training at the rescue, but she is responsive. She needs a family that understands she will need training and guidance. An active family who can give her the lifestyle that she needs. Playing ball in the back-yard is fun, but she would benefit from so much more, she is going to need a lot of physical and mental exercise. Going on road trips, to new places, hikes and adventures and letting her explore the sights, smells and sounds the world has to offer will be to hers and your benefit. It is important that her family understands the importance of basic and advanced training. We advise that families work on their own basic training so that boundaries and expectations can be set and personalities and body language learnt in the process, which will help form a much stronger bond. Tigger will make a great family addition to an experienced family. She is fun, active and very loving and deserves a good family and home to call her own. Tigger is available for adoption from Give a Dog a Home, German Shepherd Dog Rescue for an adoption fee of $500. This fee is not negotiable and is used to cover the rescue costs of pulling, vetting, health certificate, transport from Texas to Maine, monthly preventatives, supplements, food and anything else that is needed. If you feel that you have the heart and home to give this precious soul a wonderful life, please go to our website, under the APPLICATION tab, complete, then submit the APPLICATION. Our process takes around 2-4 days, and ensuring your references are aware that we will be calling, could speed up the process. Once you have been approved, we discuss any questions in regards to the dog you are wanting to adopt, then you complete and submit the contract, make payment and then we can work out the pick up / transport arrangements. Please do NOT submit an application if you are not looking to take home a new best friend within the next few weeks. http://www.giveadogahome-sanantonio.org Tigger is located at the rescue in Sebec, Maine. We post in various states along the east coast and Canada where we have had lots of successful adoptions to enable more exposure for these beautiful saved souls. Families will need to be prepared to travel to the rescue to meet and take home their new best friend. Sebec is located just outside the towns of Dover-Foxcroft and Milo (approx 8 miles) and approx 45 miles from Bangor. There are also lots of hotels, motels, pet friendly accommodations and wonderful camp-sites for the more adventurous families and what a great way to get to know your new best friend. If there are options to arrange transport, we will work with you to make it happen.